Phase 2 will include 271 homes as well as Energize, a new state-of-the-art £40m indoor sports complex. We have plans to work with OnSide to create an OnSide Youth Zone within Energize, providing young people with somewhere to go, something to do and someone to talk to. A multi-purpose retractable 3,000 seat arena which can become three separate 40x20m sports halls when events are not taking place. An indoor 3G football pitch that will be the new home for the Millwall Community Scheme (reproviding the Lions Centre). A third arena will be sub divided into areas for table tennis, gymnastics and a multi-use sports arena. A 6 lane 25m swimming pool and learner pool, a 150 station gym and a designated boxing area. 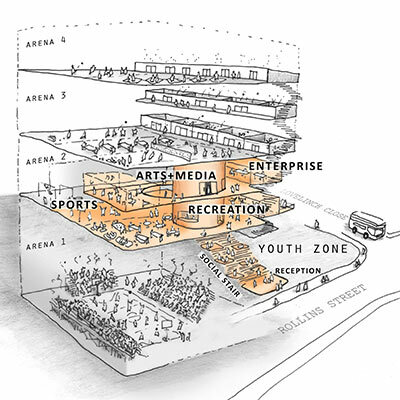 An OnSide Youth Zone including facilities for sport, art, design, beauty and enterprise amongst others.